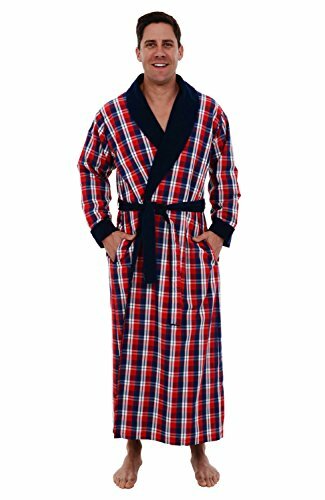 This long, water absorbent 100% cotton robe for men from Alexander Del Rossa is made from premium 100 percent loop terry cotton fabric. Our 13 ounce terry loop toweling fabric is soft, lightweight, and plush to keep you warm without weighing you down for years to come. Designed with you in mind, this luxury robe is perfect for toweling off after a wide array of activities including a shower, bath, spa day, beach day, or relaxing evening in a hot tub. Soft, lush, and rich in features, we trust that your purchase of this men's house coat will not leave you disappointed. Looking for the perfect gift this father's day? Look no further! He works hard and deserves a break - give the gift of relaxation father's day with this product from Alexander Del Rossa. Whether for your elderly father, big and tall guy, husband, son, or any other dad, we are confident that they will love this product and use it for years to come.